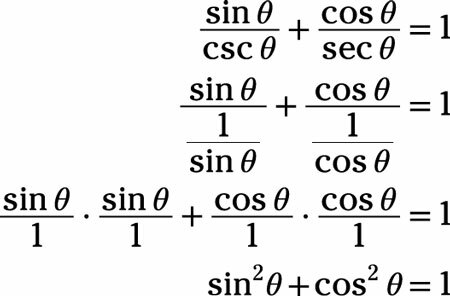 You need to become more familiar with the possibilities for rewriting trigonometric expressions. A trig identity is really an equivalent expression or form of a function that you can use in place of the original. The equivalent format may make factoring easier, solving an application possible, and (later) performing an operation in calculus more manageable. The trigonometric identities are divided into many different classifications. These groupings help you remember the identities and make determining which identity to use in a particular substitution easier. In a classic trig identity problem, you try to make one side of the equation match the other side. The best way to do so is to work on just one side — the left or the right — but sometimes you need to work on both sides to see just how to work the problem to the end. Because each term contains a function and its reciprocal, using reciprocal identities will simplify the terms quickly. Then simplify the complex fractions. The missing term is 1.